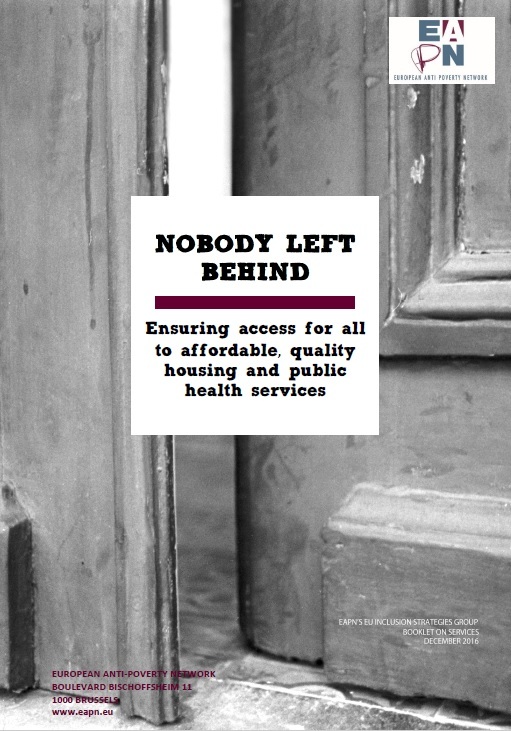 EAPN publishes its new booklet "Nobody left behind | Ensuring access for all to affordable, quality housing & public health services". EAPN members are increasingly alarmed about the declining access to affordable, quality public services (Services of General Interest) for ordinary people, in the context of increasing privatization and liberalization. With the onset of the crisis and austerity measures, key public services have been hit particularly hard, impacting on poverty and inequality. Access to affordable, quality housing (particularly a lack of social housing) and public health services have been highlighted as the main priority challenges facing people on the ground, and in particular those facing poverty and social exclusion. Maps the reality of access to housing and health services (or exclusion from them), and analyses the impact on people experiencing poverty and social exclusion. Draws on national realities and members’ experiences to provide national examples and highlight new developments, as an example of ensuring access to key Services of General interest. Proposes key messages and recommendations to national and EU policy makers in the context of current EU policy developments. The findings in this booklet were first presented to the public in the framework of the AlterSummit annual conference Rights4All Now!, which took place in Brussels on 24-25 November 2016 and was very well attended by over a 150 social activists and trade unionists from 15 European countries. The booklet was presented in the framework of a workshop entitled Defend and promote commons and public services for all, and you can access EAPN’s PowerPoint presentation, with key messages and quotes, here. Public services have become increasingly a target for policy reform, focused on austerity, and restructuring public services and as a driver to promote growth, rather than as an investment in quality universal services for all. Privatisation of public sector services as a means to reduce costs and reduce welfare states is undermining rights. The drive to privatise and liberalize services is driven by EU macroeconomic and internal market policies prioritizing efficiency concerns to reduce public deficits, through austerity and increased competition in the internal market, rather than effectiveness and equity. This is a factor in increasing poverty and inequality. Reliance on the market alone to increase the supply of housing has spectacularly failed to provide affordable housing for all. This has been exacerbated by increased de-regulation of rents and cuts to investment and supply of social housing. Access to affordable quality housing is an essential pre-requisite in preventing as well as tackling social inclusion, together with adequate income and income support. Investing in the right to quality affordable housing, including public social housing, should be seen as a priority intervention policy to prevent homelessness and tackle housing exclusion as well as reduce poverty and social exclusion. It should be a foundation to the right to a dignified life. Provision of affordable quality public health services is vital to ensure a longer and a healthier life for all, but also to promote more inclusive and sustainable growth. The social and economic costs of reduced access, directly impact on employment, as well as social inclusion, and impact negatively on growth. Reduced access to key public services and social protection are a key social determinant in increasing inequalities in health, and generating poverty and social exclusion. The European Pillar of Social Rights linked could play an important role in defending social standards, as long as it is mainstreamed to ensure that macroeconomic and internal market policies and EU funds actively contribute to guaranteeing these rights, rather than undermining them. The link to the UN Sustainable Development Goals as an overarching rights-based agenda is also crucial. The voices of the poor are essential: as a fundamental right to participation and to understand the decline in rights to services and their impact on people in poverty, and to inform more effective policy solutions.